I’ve been struggling in my mind to make a case for us all week for this game, in an effort to try and manage my own expectations and forgive me – dear friends – if this blog comes across as a little too apprehensive, but I am not looking forward to this game one little bit. It’s not that I don’t think we can do what is needed at the top end of the pitch to cause Liverpool problems, I really do think we can, but it’s our back four against their front three that really scares the bejesus out of me if I’m honest. I mean even if we had a fully fit and first choice back four it would be a difficult ask to keep Mane, Salah and Firmino from scoring tonight, but the fact we’ve got an ageing and somewhat ropey looking 34-year-old Lichsteiner who will come up against a pacey Mane, plus a relatively slow central midfielder being asked to ‘do a job’ in Xhaka at left back against Salah, means there will be plenty of spaces and opportunity for Liverpool to hurt us and that is a bit of an issue I fear. On top of that you have a player like Firmino who likes to drop deep and pick up the ball and also find his fellow attacking teammates with his vision and having scored and assisted in his last two games against us, he’s up for another unwanted Arsenal and Premier League first, which would be to be the first player to score and assist against the same team in three Premier League matches in a row. That shows you that whilst we’ll have spent a week worrying about the two wide forwards, they have a Brazilian who gets chances and scores goals against us too. It sounds like even Sokratis – who has been our best defender this season – isn’t 100% and you have to wonder that even if all of those players who were announced yesterday by the club to be ‘being assessed’ ahead of this game, are fit, how fit are they actually going to be against a Liverpool team who look to be getting their goalscoring groove back? I’m sat here on a Saturday morning in my dressing gown wondering how we’re going to get anything from the game and the only conclusion I can come to is that we’re going to have to score a minimum of three goals I think. Liverpool haven’t lost to us in six matches and Klopp hasn’t tasted defeat to an Arsenal team whilst Liverpool manager. His high octane pressing has been a thorn in our side and the slow start with which we have approached every game this season is the anthesis of how Liverpool do their work. They start fast, put press on quick, look to make the opposition make mistakes and in Arsenal we have a team still learning under Emery, still not looking 100% comfortable playing out from the back, still giving us all palpitations when the ball is in our defensive third. If I was trying to find some positivity it could be that if Liverpool do in fact press us hard and high and we do somehow manage to deal with that, once you get in behind that press it’s leaves them exposed and that’s when the likes of Ozil, Auba and Lacazette need to shine. But they really do need to shine today. We can ill afford another ‘meh’ performance going forward like Palace. On the show we did on LoveSport on Wednesday we talked about whether the players will have been feeling the after effects of three games in a week and whilst Unai is not using it as an excuse, I am secretly hoping that it had something to do with our lacklustre second half at Selhurst Park. If that is the case then there is a crumb of hope; players were rested on Wednesday night and so most of the players who will play today will have been given a full week to recover. So there are no excuses for the performance. What we do need to do though is find a way to start better. It doesn’t matter if we have to contain Liverpool for the opening exchanges, lets just not have players getting in behind within the first two minutes. Or ten minutes. Or the whole half. Or the whole match. That’d be grand. For their part I don’t think Liverpool will go completely for the jugular with us because they’ll know we have the quality to hit them where it hurts. That’s why Auba, Laca and Ozil are surely a must for tonight, but who occupies that fourth position will be intriguing. 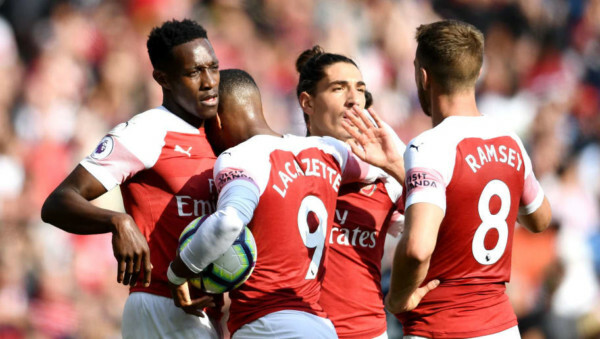 Iwobi has had a couple of indifferent games in the last couple of weeks, Mkhi has hardly impressed me at all since Fulham, Ramsey provides energy and forward running and loves the odd goal against Liverpool, but Welbeck provides a player who might not be the best in front of goal and sporadic, but will offer power and pace to hopefully peg Liverpool back. That’s why I’d be opting for Dat Guy when we start tonight. Whether or not that’s the case for Unai remains to be seen though, especially seeing as Welbeck played on Wednesday night, so I think we might see Iwobi again. But what we need to see above all is an Arsenal team with their brains switched on. If the players can’t get up for this then we got little chance of competing at the top of the division. Tonight will either be a marker laid down by The Arsenal of 2018/19, or another reason for pundits to tell us why we won’t amount to much because we can’t beat the big teams. And with the rest of the teams outside of the ‘Biug Six’ all dropping points on a regular basis to the bigger teams, it makes these games all the more important. Come on Arsenal, please, after all it is Unai’s birthday and he’ll be wanting three points and his first big scalp more than anything.